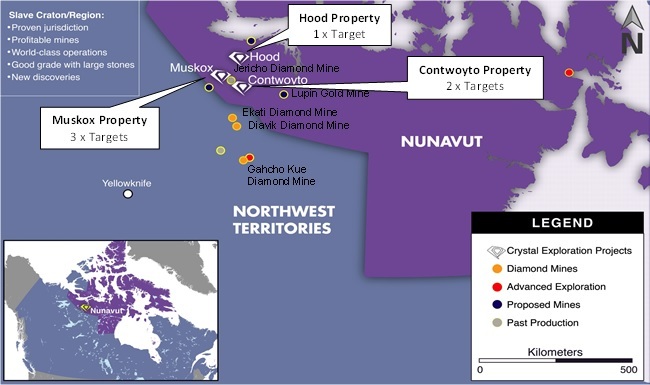 CRYSTAL EXPLORATION INC. (the "Company" or "Crystal") (TSX VENTURE:CEI) is pleased to report exploration plans for Crystal's 100% owned diamond bearing Muskox, Contwoyto and Hood Projects located in Nunavut, Canada. A three-phase exploration plan is in progress that includes drilling of 6 'bulls eye' ground magnetic targets and completing geophysics over 12 high priority lake and/or Electromagnetic based targets to generate additional new high priority targets. Diamond drilling and exploration work permits are granted across all Crystal project areas. During 2016, 146 till samples were processed of which 117 samples contain possible 'picked' kimberlite indicator minerals (KIM's) across Crystal's project areas. The samples cumulatively contain 7,386 possible KIM's that await microprobe analysis. Phase 1 - Spring program will involve a ground geophysics program to isolate additional high priority targets for drilling. The program may involve additional work over potential new acquisition properties. Phase 2 - Summer program focused on drill ready priority targets. Additional targets may be added pending the results of the Phase 1 program. The program will include till sampling and ground geophysics. Phase 3 - Fall drill program focused on expansion from the summer program. Dean Besserer, P.Geol., and Technical Advisor of Crystal Exploration Inc., commented, "The presence of diamond bearing kimberlites in this region and the quality of our targets are compelling reasons to drill Crystal's targets that were developed from the 2016 exploration program and tens of millions of dollars in historical data from the likes of De Beers Canada, Ashton Mining and Tahera Diamonds during the 1990's and 2000's."